VANCOUVER, Feb. 5, 2019 /CNW/ - InMed Pharmaceuticals Inc. ("InMed" or the "Company") (TSX: IN) (OTCQX: IMLFF), a fully integrated, cannabinoid-based biopharmaceutical company that leverages its proprietary bioinformatics and biosynthesis platform technologies to develop novel therapeutics for the treatment of diseases with high unmet medical needs, will report financial results for the three months ended December 31, 2018, which is the Company's second quarter of fiscal year 2019 ("2Q19"), on Monday, February 12, 2019. The Company's full financial statements and related MD&A for the three months ended December 31, 2018 will be available at www.sedar.com on February 12, 2019. InMed is a pre-clinical stage biopharmaceutical company that specializes in developing novel therapies through the research and development into the extensive pharmacology of cannabinoids coupled with innovative drug delivery systems. InMed's proprietary bioinformatics database drug/disease targeting tool, cannabinoid biosynthesis technology and drug development pipeline are the fundamental value drivers of the Company. 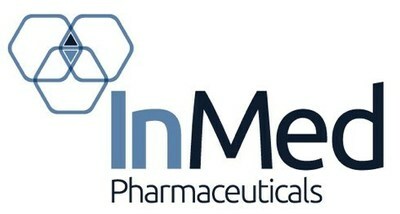 For more information, visit www.inmedpharma.com. This news release contains "forward-looking information" and "forward-looking statements" (collectively, "forward-looking information") within the meaning of applicable securities laws. Forward-looking information is based on management's current expectations and beliefs and is subject to a number of risks and uncertainties that could cause actual results to differ materially from those described in the forward-looking statements. Forward-looking information in this news release includes statements about: reporting 2Q19 financial results on February 12, 2019; the expected fundamental value drivers of the Company; and the potential of INM-750 to impact EB. Additionally, there are known and unknown risk factors which could cause InMed's actual results, performance or achievements to be materially different from any future results, performance or achievements expressed or implied by the forward-looking information contained herein. Known risk factors include, among others: financial results may not be reported on the anticipated date; preclinical and clinical testing may not produce the desired results on a timely basis, or at all; regulatory applications may not be approved on a timely basis, or at all; suitable partners may not be located; economic or market conditions may worsen; InMed's proprietary bioinformatics platform, biosynthesis manufacturing process and drug development programs may not deliver the expected level of results nor become the fundamental value drivers of the Company; and INM-750 may not have the desired impact on EB. A more complete discussion of the risks and uncertainties facing InMed is disclosed in InMed's most recent Annual Information Form and other continuous disclosure filed with Canadian securities regulatory authorities on SEDAR at www.sedar.com.